Sometime between cleaning up your kitchen from the Thanksgiving Feast, and getting in the car to go purchase your holiday tree all the baking ingredients come out of your pantry and the recipe books are opened! It is indeed the “most wonderful time of the year” when cookies become the topic of conversation and the centerpiece of every gathering. But when did it become so? Like most holiday traditions, baking cookies started a long time ago, more specifically in the times of the solstice rituals conducted way before the end of the year festivities became the holiday it is today. To find out all the details I asked a few family members (the baking experts in my family) and after only puzzled looks I went to our trusted internet search engines. I found most of these interesting facts on history.com. Ends up that all across the world people gathered to celebrate the changing of the seasons. And since the winter solstice also brought snow, cold and little farming the celebration had to include a feast before the famine of the winter. Animals were killed and kept safety to eat during the winter, the fermented beverages like beer and wine are finally ready to drink after brewing since spring, and their fruits were turned into jams to keep through the long months ahead. The end of the year celebrations started to take over the solstice rituals during the middle ages, but they kept most of the feast traditions. And every good party has deserts! Ingredients like sugar, lard and butter, spices were all expensive delicacies at that time, so only during celebrations they would be used. And cookies are just the perfect sized treat that can be shared with friends at a party and they happen to combine those special ingredients! Our modern day cookies still rely on those same traditions! Nutmeg, cinnamon, ginger are the same spices we use when baking traditional holiday cookies. The gingerbread for example uses molasses and ginger, something already in use by medieval cooks! Enough about history, now that we’ve justified our need to bake and enjoy cookies this time of year let’s talk recipes! Here are 2 version of the traditional Peanut Butter Chocolate Chip Cookie. One is gluten free using only oats, and the other uses wheat flour. Go ahead and make both versions! They are similar in ingredients but they bake quite differently and are both equally delicious. The gluten free is more of a “flaky” crisp cookie while the wheat flour version is chewier and bakes a little faster. And yes! I incorporated some of our holiday spices in them, but that is optional. The secret to the perfect cookie you ask? My trusted sources say: best quality ingredients and a good oven. Mix up Once Again Crunchy Peanut Butter with egg and sugar. Once well mixed add the baking soda, ginger spice and mix in the oats. Lastly add the chocolate chips. Make small rounds using your hands, place in baking sheet and flatten them. Bake in 350F oven for about 15-20 minutes until you notice a light golden edge. Mix flour, baking soda, salt and rolled oats and set aside. Mix Once Again Creamy Peanut Butter with sugar, vanilla and egg. Once well mixed add the dry ingredients. Lastly add the chocolate chips. Using a cookie scoop place them in baking sheet and flatten with your hands so they bake more evenly. Take it to the oven at 350F for about 8-10 minutes or until lightly golden edges. 10 ways to enjoy Almond butter prepared under 5 minutes! I will try these this year for Christmas. Thanks. Love OANB. Delicious! My family would love these cookies! Thank you for including a gluten free cookie recipe! 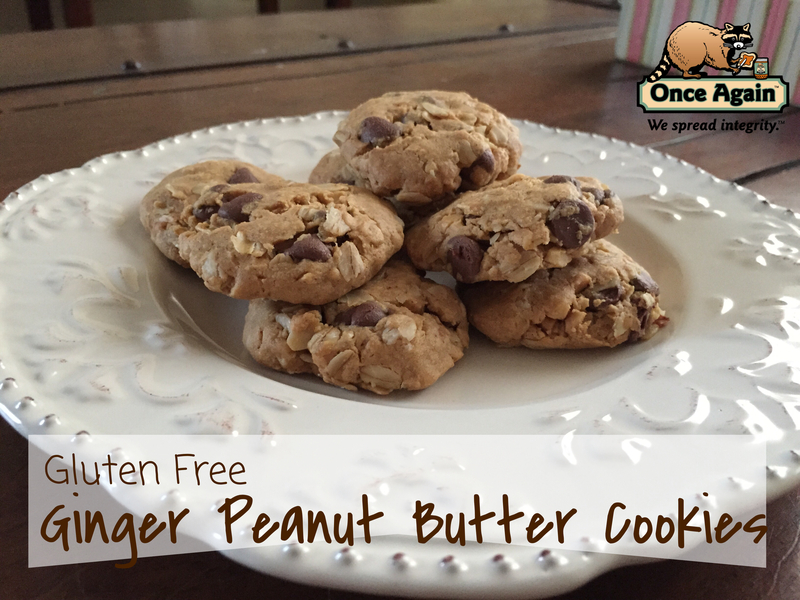 The ginger peanut butter cookie recipe is different from what I’ve had. I love ginger and nut butters; so, this recipe should be good. I will give it a try. Love to try new recipes every holiday season. Oh, this is so not helping me loose this baby weight. Lol. Sounds delicious. Peanut butter cheesecake and oatmeal recipes are a must try!